So I got another Polar FT40 heart rate monitor about a month ago and started to use it regularly with my runs. 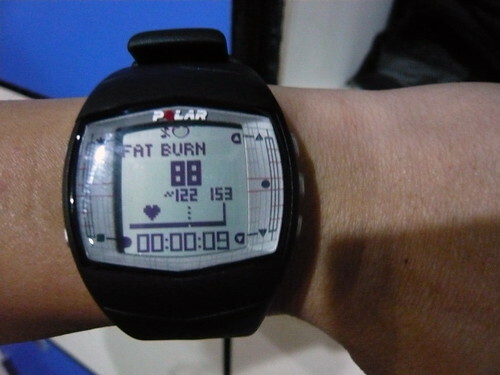 One of the additional feature of this watch is that it tracks a person's fat burn. As you can see, right from the start, it says Fat Burn. This appears during the initial stages when my heart rate hasn't picked up yet. What I noticed was that once I entered the zone starting from 122 bpm (see above), the phrase "FAT BURN" will change into "FITNESS" and my understanding is that this is when I start burning carbohydrates for fuel. This completely overthrow what I used to understand. Drinkers get fat cause the alcohol gets in front of carbohydrates when burning fuel, that results in unused carbohydrates being converted and store as fats. Easy to get fat but hard to lose them is explained here. Fats, as you can see in the list, is the last to burn. Since most of us are eating adequately, we hardly get the chance to dip into our reserves to burn that stored fat. Over time, what happens is that your fats accumulate as more and more unused carbohydrates are being converted and stored. The Atkins Diet works on this principle where it restricts you from taking alcohol, oily fried (fats) and carbohydrates but you are free to go crazy with meat (protein). As for fruits and vegetables, fruits is not permissible due to its sugar content while vegetables are allowed due to their relative lack of sugar (carbohydrates). So the theory is that now that alcohol, fats and carbohydrates are eliminated from your diet, all you have left to burn for fuel is your protein intake. However, protein yields very little fuel which means that you would finish burning your protein intake pretty quickly. Once that is out of the way too, you have only fats to burn and therefore, you will start to lose the fats i.e. this is when the diet starts to take effect. So here's my problem which I am now totally confused. My interpretation, according to what I read from the watch, is that you are burning fats for energy as long as you keep your heart rate under the zone? And that once you hit the zone and higher, your body switches over the carbohydrates? Here's the screen shot after an 8k run. So I burned 1169 calories in that 1 hour run of which, 10% of that 1169 calories (116.9 calories) is fat burn. It is very confusing in the sense that here I am running like mad only to find out that a leisurely stroll i.e. keeping the heart rate low, who have been the easier way to lose fat? Would appreciate any running experts to provide some enlightenment. From what I have read and understand, to effectively to burn fat (making the calories use fat instead of carbo) is to run slow for a prolong period of time. Definition of run slow: run less than 80-85% of your maximum hear rate and faster than 60-65%. 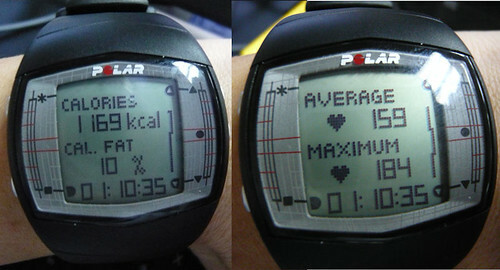 I believe this is the definition of fat burn in the polar watches. The optimum heart rate zone for burning fat is 60% - 70% of your maximum heart rate threshold. Your maximum heart rate threshold has been established to be approximately 220 heart beats per minute (bpm) less your age. For example if you are 40 years old, your maximum heart rate is 220b bpm less 40 giving 180 bpm. If you over clock the running ie running 80-85% of the heart rate you would only be burning sugars and carbs as you do not have enough oxygen to start the fat burning. niko & LadyRed: Thanks for the input. Krisandro shared this very useful article clarifying this confusion. From what I have been reading and actually doing it ; I am not really concerned of what amount of calories I burn during a work out.... of course the more the better. but I am focussing more on the metabolism rate of our body. Muscles burn energy just by sitting around and doing daily activities, fats do nothing. So the more muscles you have, the higher rate of your metabolism. thus you will lose fat (not weight) easier as you continue working out. So I work out with weights.. gain some muscles.... take low fat / oil and high protein diet... and my body fats % drop considerably. My results.... I started from 95Kg to 86Kg now in about 4 months, and I am a lot stronger than before. A consistent regime of regular exercise will also raise your metabolism rate even when not exercising. You are right to say, the more calories burned the better, regardless from where. 95 to 86! Wow. That is quite impressive. 加油!